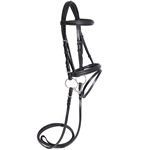 Made with exquisite Italian leather, the Nunn Finer Verona English Bridle is crafted by leather artisans with generations of leather workmanship experience. The Verona comes with a fancy stitched crank cavesson as well as matching reins. 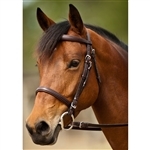 Wider style brow and noseband follows the new show ring trend. Matching, raised fancy stitched reins with hook stud ends. Great quality and a great look at a fantastic price. Made with exquisite Italian leather, the Verona Bridle is crafted by leather artisans with generations of leather workmanship experience. The Verona comes with a fancy stitched crank cavesson as well as matching reins. Wider style brow and noseband follows the new show ring trend. Matching, raised fancy stitched reins with hook stud ends. Great quality and a great look at a fantastic price.